Get ready to contort your body and form poses called Folded Leaf and Flying Bird that you never thought you could do at Acroyoga classes by Shakti Shilpa. I head to an apartment on Kasturi Rangan Road and meet with Shilpa and a small group of about five people for my first Acroyoga session. We lay out yoga mats on the floor and begin pairing up. Starting with basic stretches with the help of our partners, we warmed up the body for the session. You can bring a bestie or bae along for a class (or just yourself), but partnering with a stranger is also pretty interesting. Once you ease into each pose, you realise that a lot of it has to do with communication and trusting your partner. 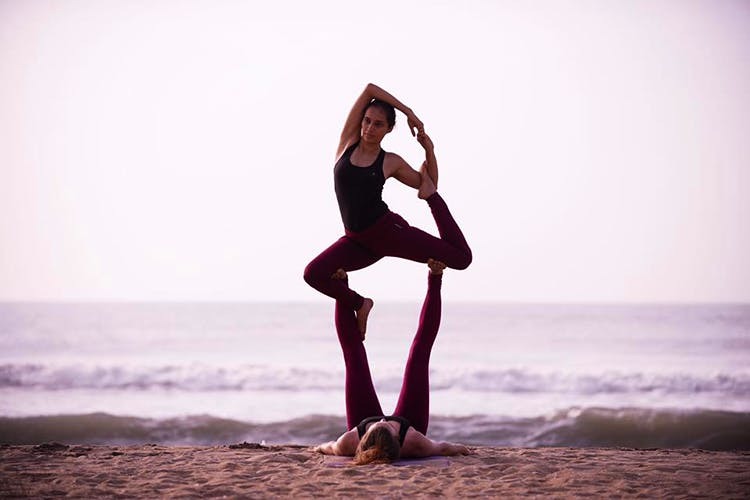 Acroyoga is a combination of acrobatics, yoga, and Thai massage according to Shilpa, so expect a session that’s not just about strength and flexibility but one that is also calming to the mind and body. Ten minutes in and I’m doing a plank over someone else who is also doing a plank and this is called Double Plank. The person on the ground is the Base and I’m flying. The Base should balance and support the Flier and the latter needs to breathe and let go. There’s also a Spotter who watches to make sure the Flier is doing okay. Guys, Acroyoga is all about trust. And it’s all in your head — what you can do and what you can’t do. Shilpa suggested I try the Folded Leaf (this is where she’s the Base, lying on her back with her legs up at a 90-degree angle). I needed to position my hips against her feet and just fall over with my legs parallel to the floor. My head had to hover over her stomach and she kept telling me to release the tension in my hands and let them fall freely. After a few moments of absolutely freaking out, I did it! It was a pretty incredible feeling of ‘just hanging out’ over someone’s legs. Once I began to trust in Shilpa’s incredible strength we even attempted The Flying Bird, which is similar to the Folded Leaf but I needed to push my chest up, spread my wings, I mean hands and emulate a bird that’s soaring in the sky. This felt amazing — like I could conquer anything in the world. I highly recommend that everyone give Acroyoga a shot. Attend a session (Shilpa charges INR 500 per class) and be in awe of what your body is capable of! Shilpa organises workshops with fitness studios, private clubs and has her own workshops as well. She’s held sessions at the Covelong Point Surf, Music & Yoga Festival and even done a few in Kochi and Bangalore. She organises regular classes that happen twice a week (Wednesdays and Sundays) and she’s even planning on beach sessions soon. We can’t wait! Curious to try Acroyoga? Attend one of the Acroyoga jams that happen every Sunday at Semmozhi Poonga between 4pm and 6pm!